Madhav Giri has spent the last 18 months in bed after a serious spinal chord injury left him unable to walk. Months of rehabilitation therapy at INF’s Green Pastures Hospital and a major rebuild on his family’s land, means he has been able to return home and dream for the future. 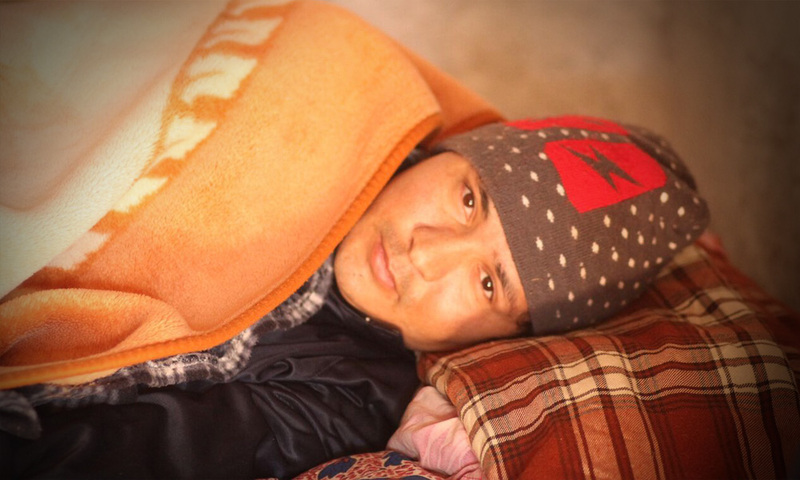 31-year-old Madhav is from Parbat District, 65kms from the city of Pokhara. Like many Nepalis he had been working in the Gulf countries to support his family and was home spending time with them when the accident happened. Madhav was working on his family’s farm, ploughing the field when an ox charged at him. He was left unconscious and taken to hospital where doctors determined he had a serious spinal injury from the attack. Subsequent surgery, hospital costs and medication saw Madhav use all of his savings but he remained unable to walk. The severity of his injury meant he found it difficult to sit or hold onto objects. He was referred to INF’s Green Pastures Hospital for rehabilitation where he stayed for two months. INF staff worked tirelessly with Madhav; although progress was slow they were committed to helping him return to his family. Prior to the accident Madhav’s family had been living on the first floor of a house, which presented difficulties for his return home. INF’s community based rehabilitation team assessed the living arrangements and acknowledged the need for Madhav’s family to have their own house on the ground floor. INF assisted the family by building two new rooms and a toilet on the family’s land. This enabled Madhav to return home and be cared for by his family. Today Madhav is living in the new house with his wife, mother and their three children. His wife is thankful to INF for all their support, especially in making it possible for her to look after her husband. She looks to the future and hopes that Madhav will soon be able to use a wheelchair and one day start their own small business. INF’s Community Based Rehabilitation [CBR] program began in 1970. It aims to see people with disabilities empowered to take an active part in their society. It does this through assisting people living with disability, as well as educating communities on how to accept and value people living with disability.